« The Barn Has a Website! I have been told, under no uncertain terms, that if I don’t contribute something to this blog my sister is going to change the name to “Pajari GIRL.com”. Here is the deal…and I cannot stress this enough….the Great Pyrenees, as a breed, are NOT for everyone. I’m not entirely sure who they ARE for, but I know for a fact they aren’t for everyone. If you have seen the pictures and heard the stories on the blog and are tempted to run right out and get your self a “Ginormous White Slobbering Dog”, I will tell you right now… DON’T EVEN THINK ABOUT IT!!! Attraction for humans… they are huge, they are unique, they are fluffy and white. What humans quickly find out about them….they are huge, they are stubborn, they wander, they do things on their terms and being that they are sooo white a fluffy you will spend more on grooming than you will spend on your next car. Jai is a dog that someone decided they just had to have. And then sadly they decided that he was too big. And he was too loud. And too expensive. And too energetic. And too destructive. Andy waay too much to groom. And so, he was left tied to a tree to die. I will not give up on our Ginormous White Slobbering Dog. I will keep reading. I will keep talking to people with breed experience. We’ll keep working with him and someday we will find a compromise he will agree with. I’ve had the pleasure of knowing a couple GWSDs. It was a pleasure because they were NOT mine. I got to witness the ‘issues’ you listed, but then toddle on home and leave it all behind. All, that is, except my heart …. Oh how they captured my heart. And nothing snagged me harder than the ability to lift their GWSD bodies upright and ever so gently hug. Perhaps the problem is that GWSD language is not a dialect we learned from our other breeds. Surely, these gentle giants WANT to be good. Don’t they? Great blog! He is a lot to love. And if anyone can find a compromise with this one, you can. We’re all rooting for you! 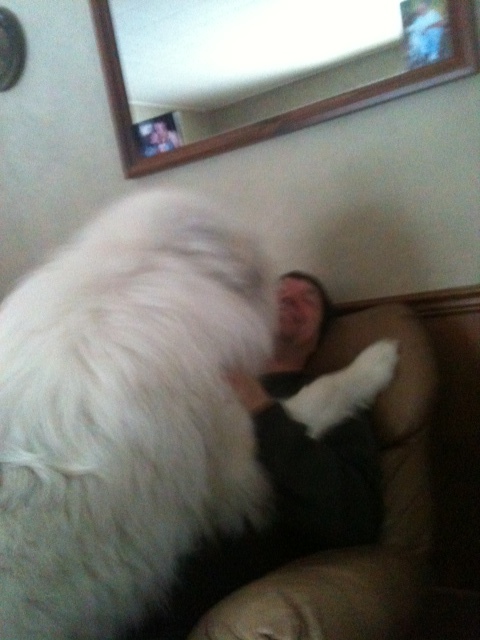 My in-laws had pyreneans. The male was an absolute horror. His appetite was insatiable. He could fell 18 eggs, a whole cherry cake, and the neighbour’s sunday roast chicken! He had way too much energy for a suburban block (3/4 acre at the time mind you!) and was eventually despatched to a farm where he could run. And run. And run. The female, on the other hand, was a delight. What person would leave a dog tied to a tree to die? THAT name needs to be on the People I May Choose to Run Over Given the Chance list I keep in my glove box of the Camaro. Secondly, what a fabulous angel you are for saving him from the wretched tree. I thank you. Does gwsd stand for great white shedding dog?